Please submit your manuscript online via Editorial Express, www.editorialexpress.com/efd, by August 1, 2019. Selected authors will be notified by September 1, after which the registration for the EfD Annual Meeting will be open. Final draft accepted papers must be submitted by October 21 to be included in the final program of the annual meeting. Sida is supporting the EfD 2020 Research Cycle with one million USD. The selection is made by a Research Committee consisting of international experts. Research proposals for 2020 funding in all EfD research themes can be submitted in a two-stage process. In the first stage, any interested researcher residing in an EfD center in the Global South should submit a short first-stage proposal (a maximum of four pages excluding references – times new roman 12 pt font, 1.5 line spacing) to EfD through Editorial Express (www.editorialexpress.com/efd) by March 31, 2019 at the latest. Please strictly follow the attached first-stage proposal guideline. The EfD Research Committee will evaluate the first-stage proposals and will invite selected PIs (around three proposals per center) to submit a full proposal through Editorial Express (www.editorialexpress.com/efd) by August 1, 2019. In order to allow time for peer review before the annual meeting, proposals submitted after the deadline will not be accepted. Second-stage proposals will pass through a blind review process. Based on this review and an assessment to what extent the proposed research fulfills the stated policy research review priorities, the EfD research committee will select the most promising proposals for presentation at the annual meeting. Final funding decisions will be made after the presentation and discussion at the Annual Meeting. Please note that the EfD research fund will be allocated on a competitive basis. The EfD research committee favors policy-relevant projects with high potential for publication in reputable peer-reviewed international journals. Sida has stipulated that the selected projects should combine policy relevance with a focus on poverty alleviation, environmental sustainability and gender analysis. The proposals should preferably be developed in collaboration between EfD Senior Research Fellows/Research Fellows, International Research Associates, and young researchers (post-docs or graduate students). Their duration is expected to be one year and the budget between USD 30 000 - 60 000. Note that all proposals from EfD countries should be presented and pass through a local peer-review process (stake-holder interaction and academic seminar presentation) prior to submission to the EfD network. Proposals selected for presentation will be notified by September 15, 2019, after which the registration for the annual meeting will be open. Final draft accepted proposals must be submitted on October 21, 2019 at the latest to be included in the final program of the annual meeting. 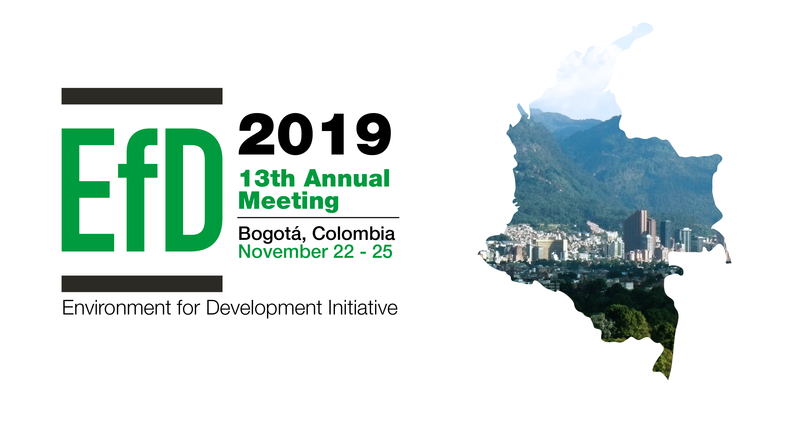 The EfD Annual Meeting will be held in Bogotá, Colombia, 21-25 November 2019. It is being organized by EfD Colombia together with the EfD Unit in Gothenburg. Questions related to local arrangements can be directed to Jorge Bonilla, Director of EfD Colombia, through jobonill@uniandes.edu.co. The EfD network will cover travel and local costs for EfD researchers whose proposals or papers from EfD-funded projects have been accepted for presentation at the annual meeting. EfD covers local cost (not travel) for EfD researchers (Senior Research Fellows, Research Fellows and International Research Associates) with accepted papers. Other participants are expected to cover their full cost to participate in the meeting. If you would like to attend the annual meeting, or if you have queries related to the conference, contact Susanna Olai, EfD Program Manager (susanna.olai@gu.se). Questions related to paper submissions and research proposals can be directed to Haileselassie Medhin, haileselassie.medhin@gu.se.